Build your business with Warm cold emails. Reaching out to potential clients can be a nightmare. But year after year, hundreds of freelancers tell me it’s one of their top strategies for finding new clients. It’s also a strategy I use to consistently drive some of my business’s biggest months in revenue. 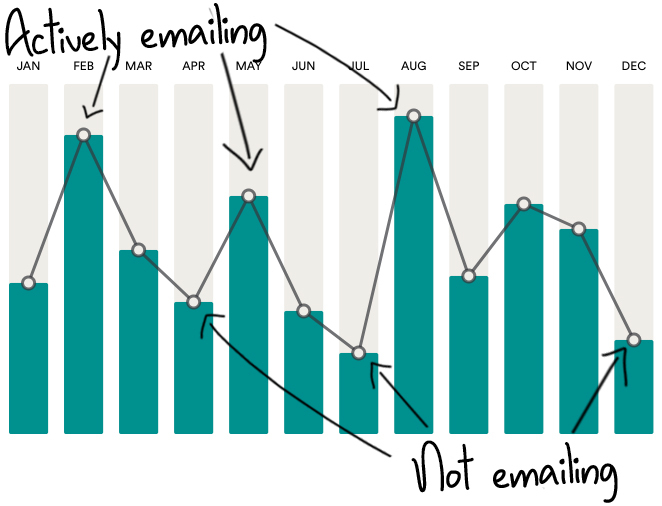 It’s pretty easy to see in the chart below: when I focus on cold-emailing, my business has a great month. When I stop emailing, sales go way down. After years of trial and error, I’ve realized there are a few key ingredients to getting your emails opened, read, and acted on. In a world where most emails get completely ignored—having an effective cold email strategy can be a game-changer. Imagine if you could turn new clients on and off like a water faucet. With effective cold emailing, you can. I’ve used this method to book dozens of quality clients for my business over the last decade, bringing in hundreds of thousands in revenue. Why does this method work? Because it gets 50%-75% open rates from complete strangers (see below). Higher open rates + quality email body means higher conversions and more clients. And I’m not the only one using warm cold emails to build my business. My friend, Jason Zook, has sold over a million dollars in sponsorships with warm outreach—emails that are tailored to each sponsor and deliver a real, human message. My friends David & Lou use warm email methods to regularly secure hundreds of thousands of dollars in new client work for their creative agencies. And countless other creative professionals around the world are putting their own personal spin on these warm cold-emailing techniques to build their businesses, connect with dream clients, and win the kind of work they’ve always wanted. In this course, I break down each individual element of an irresistible cold email. Each module will cover a different piece of the overall formula. In the final two modules, we’ll talk about the art of the follow up and, finally tie it all together in module 8 where you’ll build your own cold email framework that you can use moving forward in the last two modules: the follow-up and tying it all together. Even though we’ll craft an email pitch, many elements of this formula can be modified to fit a phone call or in-person meeting with a potential client. Each module contains activities which, if you treat seriously and complete as you go, will take you on a journey to craft your own cold email framework which you can start using immediately as a foundation and basis for your own client outreach. This course is not a collection of scripts or cookie-cutter solutions meant to promise unrealistic overnight success. Instead, I’ll teach you the basics of powerful copywriting together with the psychology of what gets potential clients to say “yes” to your pitch. I’ll arm you with the deeper knowledge of what makes an email easy to respond to so you can take what you’ve learned in this course and apply it to client outreach of all kinds—phone calls, Facebook ads, direct mail, and more. This is solid ACTIONABLE information on cold emailing! Free lifetime updates—We’ll update this course any time we find relevant research on the subject of cold emails. We’ll also include extra modules as we receive feedback from you, our customers, and as we learn more about cold emailing from our own efforts. Any update we make to this course, will be yours, 100% free. 8 modules, 60 pages—This course is concise, but packed with actionable advice and easy-to-follow activities. Your own cold email framework—by the end of this course, you’ll have drafted your own cold email framework that you can start using immediately to get more high quality clients. You can level up your cold-email outreach starting today with Cold Emails that Convert. Get your copy and start selling more now. As with all our products, this course comes with a 100% money-back guarantee. If you complete the course and are not pleased with your ability to craft convincing cold emails that convert, simply email us at [email protected] and we’ll gladly give you a refund.